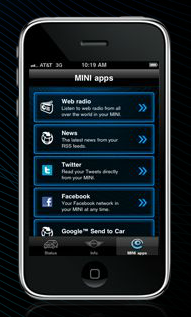 If you own a MINI with MINI Connected as well as an iPhone, you should also own the free MINI Connected iPhone app. You and your MINI will be connected to just about everything with this portfolio of helpful apps. Download the MINI Connected App directly from the App Store.